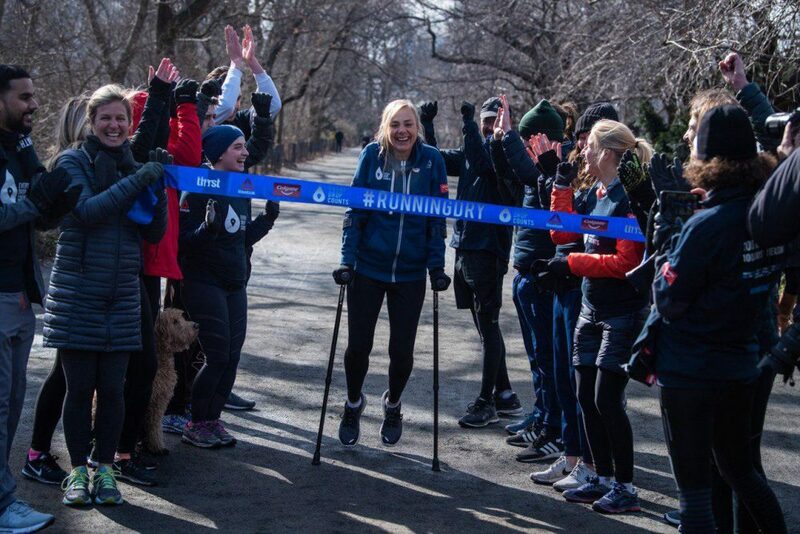 NEW YORK, February 11, 2019. International water activist, Mina Guli’s #RunningDry movement came full circle on Monday 11 February, 100 days after Mina kicked off by running the New York Marathon. Having initially started as a solo campaign for Mina to run 100 marathons in 100 consecutive days around the world to raise awareness for the global water crisis, the campaign turned into a movement after marathon 62 when Mina fractured her femur and was no longer able to continue on her own. Thousands of people from more than 44 countries across all 7 continents banded together to cover the distance for Mina, logging a collective distance equal to the distance from the North to South Pole, whilst at the same time pledging to do what they can to save water. The sport of running was used as a way to highlight water issues around the world. “Over the past 100 days we have seen first-hand the enormous impact on families, communities and economies when taps run dry. But we have also had the privilege of meeting incredible water heroes around the world who are 100 percent committed to helping save our most precious resource,” says Mina Guli. Starting with the New York City Marathon on the 4th of November 2018, Mina ran a marathon every day, while travelling to run across Europe (UK, France, Italy), Uzbekistan, India, China, Hong Kong, Dubai, the Middle East (Jordan, Palestine, Israel), and South Africa where an acute fracture was identified in her femur. She then went on to Australia before heading back to the USA to finish the 100-day journey back where she started in New York. “When I broke my leg in Cape Town someone told me an old African proverb – if you want to go fast, go alone; if you want to go far, go together – which perfectly sums up the #RunningDry movement,” says Mina. “Together we have created a movement for change – people around the world stepping up for water saving, and committing to making sure every drop counts. Watch this space for an exciting initiative for World Water Day on the 22nd of March from the #RunningDry team. Please continue logging your kilometres for #RunningDry and pledging to do what you can to help save water.